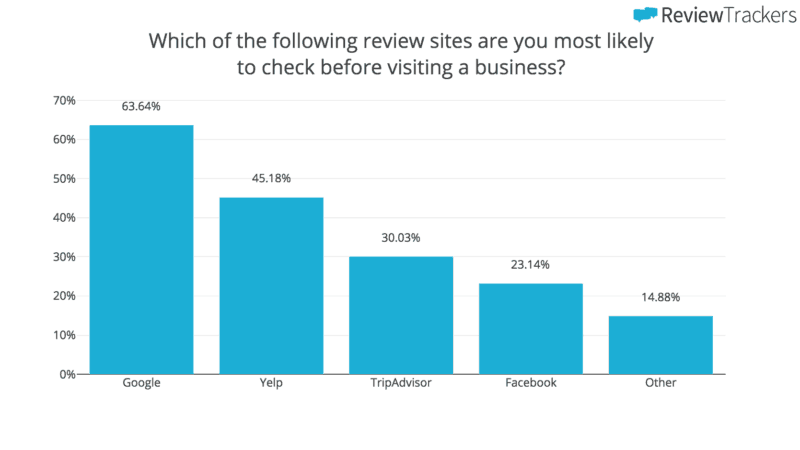 Consumers use online reviews as a research tool when they search for local businesses. As a result, reputation management is a focused part of marketing efforts. 2018 brings many notable shifts among online review trends. The 2018 ReviewTrackers Online Reviews Survey: Statistics and Trends assessed these trends. Here are some of the key takeaways and tips for managing your online reviews in 2018. Google became the main focus for consumers over the last three years. One of the most important trends this year in online reviews is that Google is becoming the main focus for consumers. 63.6% of consumers say they are likely to read online reviews on Google before visiting a business. Google is also the #1 site where consumers leave reviews. That means marketers in the hospitality industry must pay attention to Google. There are a couple nuances that marketers will need to know when it comes to Google reviews. Google is different than review-specific sites. Google is different from other sites when it comes to reviews. Even if a consumer is not looking specifically for reviews, they will still be able to see reviews and ratings.When searching for something like “pizza,” for example, it’s easy to click on a business under Google’s map. Meaning: Even if a consumer is just searching for images of pizza, businesses near the searcher will still show up under Google’s map on the first page of search results. Consumers also for hotels in a specific neighborhood of a city, or for hotels near that one famous restaurant, all on Google maps. The increasing amount of reviews on Google in the last three years explains why Google placed a greater significance on them. Reviews thus now influence local search results. Hospitality marketers should focus efforts on regularly getting more reviews on Google. They should also have a Google My Business page for each business location. Consumers leave more and more reviews on non-review sites. ReviewTrackers analyzed 9 million reviews (unaffiliated with ReviewTrackers clients). They found more than half of a business location’s reviews were on Google and Facebook in 2017. This is a big shift from 2015. Back then, most business reviews were on Yelp and TripAdvisor. Brands miss opportunities to meet consumer expectations. Consumers expect businesses to respond to their reviews. But businesses are not taking advantage of opportunities to meet customer expectations. This is a problem, especially because review responses are an important part of brand reputation. If a guest that is searching for a hotel to stay at in Chicago notices a hotel responded to negative reviews, then there’s a greater chance that consumer will stay at that hotel. 45% of consumers report they are more likely to visit a local business if the business owner responds to negative reviews. Businesses must listen to the customer. Listening to guest feedback is not a new trend. It has been a necessary part of running any business for years. Listening to feedback in online reviews as an addition to other forms of feedback like surveys, however, is a relatively new concept. But, the most important reason to manage reviews is to listen to consumers when they talk about their experiences and expectations. Let’s say multiple consumers write about how hotel rooms are messy when they arrive. You can use this information to rethink your cleaning operations to make sure rooms are as clean as possible when guests arrive. Google is the starting and ending point for consumers. It’s where they write reviews about their experiences. It’s also where they read reviews about other guests’ experiences. Review management will help guests find you. And it will make sure that when guests do find you, they like what they see. The feedback in reviews provides insights into the guest experience to improve business operations. Optimize your ability to delight guests with an experience that meets and exceeds expectations. Author bio: Megan Wenzl is the associate editor for ReviewTrackers, an award-winning customer feedback software that helps businesses transform the customer experience. Megan is a dedicated storyteller who loves helping businesses succeed.